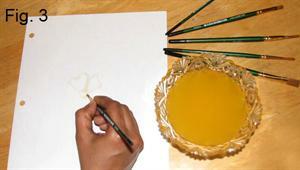 Read this article to know the details regarding how to make an invisible ink using an orange juice. Here you will get informations like requirements for the experiment, procedure of the experiment, chemistry of the reaction & care needed to be taken while doing the experiment etc. Every science experiments must start with an aim. That means while doing an experiment you must think for what purpose you are doing this experiment. That should be in your mind so that you can go through the entire experiment very easily. In this experiment your aim must be to show how the acidic properties of an orange juice can be used for making an invisible ink. See Fig 1. Remember that there will be a principle associated with each & every experiments in chemistry. So I think you have got an idea regarding the nature of the experiment that is going to be described here. The acidic nature of the orange juice plays an important role in the chemical reaction that takes place here. This is a simple experiment. The next point you have to keep in mind regarding this experiment is related to the requirements, procedure & conclusion of this invisible ink experiment. For conducting this experiment, you will require the following items. See Fig 2. For doing this experiment, it is better to use a fresh orange fruit. Cut it into two pieces so that you can easily take the fresh juice from this fruit by squeezing it. It is better to use a half portion fruit for this purpose. Collect the orange juice in a small bowl. Before adding the orange juice to the bowl, make sure that it is well cleaned. 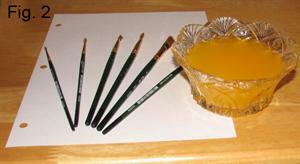 In the second step you must keep the brush into the bowl containing the orange juice. Make sure that the bristles are covered with sufficient quantity of orange juice. Take the white paper & you must write or draw anything on it using the brush (already immersed in orange juice). See Fig 3. If needed, you can recoat your brush several times. Allow the paper to dry for several minutes. After drying the paper, you may not be able to see what you have written or drawn in it. Then hold your paper to a heat source & after sometime you may be able to see some changes on the paper. That means you may be able to see a brown color along the picture or message (what you have written on the paper). See Fig 4(After dried using an heating source). 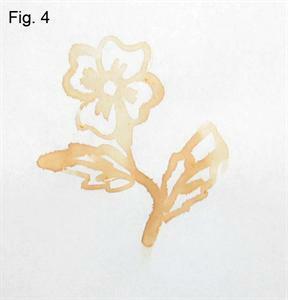 The highly acidic orange juice (acting as an ink here), when applied to the white paper, weakens it. So what happens is when this paper is placed on a heating source, the acid content present in the paper (even after the fruit juice is dried) will turn brown revealing the whole message or drawings made by you. Parents/teachers should watch their children who are doing this experiment. The presence of heating source in this experiment is a dangerous one. So care should be taken while doing this experiment. How to Make an Invisible Ink Using the Things in the Kitchen of Your Home? The article provided details with regard to the procedure to make the invisible ink using the most basic things available in the kitchens of every house, The children can use it to write secret messages or as an experiment to be displayed in the science exhibitions held in their schools.It also explains the reason for the above results. How to Show a Volcanic Eruption at Home Using the Baking Soda and Vinegar? The article explains the procedure to show volcanic eruption at home using the sodium bicarbonate or the baking soda and the vinegar. The children can do this at home without the need for any costly materials. The article provided the reasons for the eruption of the model volcano which is the neutralization reaction occurring between vinegar and baking soda or an acid and a salt. This is a simple experiment that can be conducted at house using simple resources. This will give you an idea as to how solutions made with the same resources but in different quantities, mix with each other according to there density. Enjoy the rainbow formed using different colored solutions.